Artists include Natasa Biza, Kio Griffith, Nancy Ivanhoe, Dimitris Katsoudas, Despina Nissiriou, Aliki Pappa, Ty Pownall, Nikos Sepetzoglou, Fran Siegel, Dimitra Skandali, Valerie Wilcox, and Alison Woods. “In the Stillness Between Two Waves of the Sea” is an exchange between artists from Greece and California, creating a dialogue between these seemingly disparate cultures. Like a cartography of places and approaches, this exhibition will map points of coexistence among chaotic global politics. Although works from “In the Stillness Between Two Waves of the Sea” vary greatly in terms of media and concept, most exhibit a sense of tension with regard to contemporary culture. 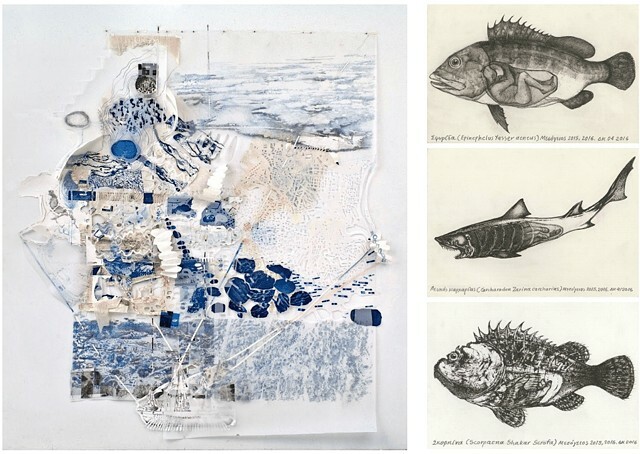 Some works have a more political slant, like Dimitris Katsoudas (Greece), whose drawings of marine life represent refugee children who have braved the Mediterranean waters in search of a better life, while Kio Griffith’s (U.S.) large format drawing of a warship built with Japanese and American parts, references the coincidences in the familial history of the paternal (Griffith) and the maternal (Shukuya) who fought as enemies for United States and Japan during World War II. Others have used the fluid nature of memories to forge disparate relationships. Fran Siegel’s (U.S.) monumental density drawings layer pigment, pencil, monofilament, mirror, and mylar to reference environmental patterns from her diverse repository, while Aliki Pappa's (Greece) installation of 38 graphite drawings of shipwrecks are fused with her own personal memories to become a subconscious storyboard, defeated in a battle of time. Some artists from “In the Stillness Between Two Waves of the Sea” have used discarded materials as a means to comment on the human condition. Nikos Sepetzoglou (Greece) and Valerie Wilcox (U.S.) use humble materials that appear cobbled together, creating a mash-up of time, movement, decay, and change. A second show of exchange will travel at the Aegean Center for the Arts in Paros, Greece, giving artists an opportunity to participate in the creation of site-specific works in both countries while offering a glimpse of the concerns that inspire them in locales thousands miles from each other.